Canadians create a profile and share photos and videos from their communities and then comment on fellow contributors’ submissions. Yates said this platform allows Canadians to “share their view of the world with us,” and that his team handles between 20 and 50 submissions a day. Some of the content is pushed out to other CBC platforms – be it online, radio or television. Yates said that the majority of user-generated content is photos, with 80 per cent of them being ‘slice of life’, compared to breaking news. Having a lot of softer content has led to an adaptation of 6 p.m. television newscasts in some regions, so that it can be shown off. As such, the Editor’s Picks portion of the Your News page provides an opportunity for online editors to show off reader submissions that may be interesting, but not necessarily newsy. All of the content from this initiative was shared across regions and on the main cbc.ca community site. Sometimes, however, the content is has a high news value to the entire network. As an example, Yates cited a woman who was on a Via Rail train when it derailed in 2012. “She had the wherewithal to take some photos on her phone, which she then sent to us,” Yates said. Those photos were uploaded to cbc.ca, and ran on the main news network with reports of the derailment. Sometimes, the content may not fit into the news agenda at all. As an example, he pointed to a feature pegged to Valentine’s Day that his community editors created, asking if opposites do attract – calling on members sent in their love stories. Extreme weather always gets the most contributions from the community. Yates said the cbc.ca community has developed a reflex that if there’s something big in weather, he expects a lot of contributions. His team also puts calls out for content – during the Prince William and the Duchess of Cambridge’s visit to Canada in 2011, cbc.ca asked readers to tell their stories about seeing the royal family. They received more than 200 submissions. “We got stories and photos from Will and Kate’s visit, but we also got photos dating back 100 years, going back to King Edward. It blew my mind – these are photos that had to be scanned in with the intention of sending these to us,” Yates said. Yates and three others form the small team behind cbc.ca’s community initiatives in Toronto, but some of the regions have created their own community manager position. “Each region makes its own decision on online resources of course,” Yates said, adding that Calgary and Winnipeg have community producers. Yates’ team does examine all submissions to ensure they meet cbc.ca’s standards before they are posted. With 20-50 submissions a day, Yates is conscious of this vetting taking up too much of the daily tasks. “We do very little. I don’t copy edit unless it’s egregious. We’re conscious that we could get bogged down if we put too much effort in,” Yates said. Yates said if the submission is breaking, it will be sent onto the alert desk “and they decide what to do with it,” or it is forwarded to regional newsrooms if there’s a strong local element. Focusing on the live experience is important to Yates. 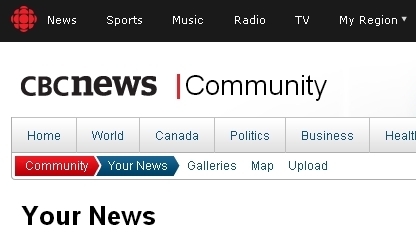 Recently, cbc.ca has been experimenting with live webcam chats. As part of its Human library, it hosted conversations with many guests taking questions from the community, including Margaret Trudeau speaking about mental health, and Robert Munsch singing ‘Love you Forever‘. “We had 15-20 webcam questions and hundreds of text questions from all over Canada. It was an amazing live experience,” Yates said. To Yates, questions and comments from the community are a vital part of user-generated content, and help direct the conversation. As part of our conversation, Yates took issue with my examination of “community newsrooms”. He pointed out that his community desk isn’t a newsroom, but is part of the greater desk serving online, television , and that his belief is that someday it won’t exist. For the last two,almost 3-weeks now, I’ve been unable to access CBC.ca on the www. In the past I’ve been able to read the news and learn about what’s going on at home. I’m presently living and working in China. Having gone to another province in North Central China, I found the same problems I was experiencing in the South East of China. I am hoping someone can get back to me with an answer as to whether this is happening throughout China, or just to me, strange as it may sound. Please do not tell me you’re not having any problems in Canada. I know that, but like I said, I’m not in Canada, I’m in China. If someone could forward this to the CBC I would appreciate it. As I’m unable to notify them as I cannot access them on the Web.